Aneta Kovacheva (MSc Economics, MA Political Science, MA European Union Studies, PGQ Law) is part of the Black sea team for the MSP Platform, in particular for Bulgaria. Aneta Kovacheva is a senior consultant at Ecorys South East Europe (Bulgaria) and carries out studies, analyses and evaluations in various social science fields. For the MSP Platform, she gathers MSP relevant projects and practices in the country, maintains contact with relevant stakeholders, reviews MSP related funding opportunities, and attends workshops and conferences. 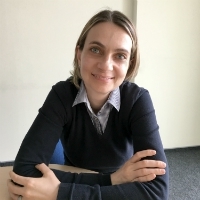 Aneta Kovacheva is Black sea basin researcher for the Multi-use in European Seas (MUSES) project where she identifies, studies and analyses various multi-use combinations (e.g. fisheries and tourism, environmental protection and desalination).